Tag Archive | "Zebra Plecostomus (Hypancistrus zebra)"
The Zebra Plecostomus (Hypancistrus zebra) a.k.a. 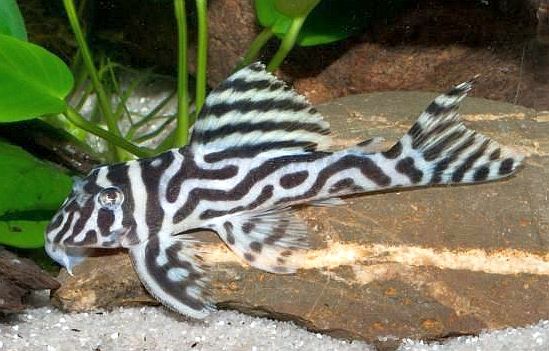 Imperial Pleco, or Zebrawels is a species of armored catfish endemic to Brazil where it occurs in the Big Bend area of the Xingu River; a tributary of the Amazon. Many tropical fish keeping enthusiasts regard the hard to find Zebra Plecostomus as the “most beautiful” of all Loricarids. The Zebra Pleco is a dwarf species of suckermouth catfish that reaches a maximum size of only 3-1/2 inches. 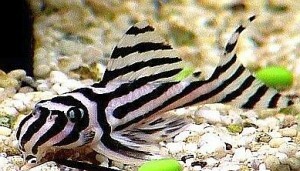 Its name is derived from the striking black and white striped color pattern on its body and fins that resemble the markings of a Zebra. Mature males have a larger head and longer interopercular spines than the females. 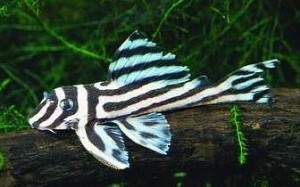 In terms of the L-numbering system, the Zebra Plecostomus (Hypancistrus zebra) can be purchased as L-46, L-98, or L-173. Because construction of the Belo Monte Dam in the Xingu river has impeded the flow of water in their distribution range, the Brazilian government has listed them as being endangered and has banned the export of Zebra Plecos. Consequently, only captive bred specimans are now available for sale to tropical fish keeping enthusiasts and all are extremely expensive and rarely available for purchase. The Zebra Plecostomus is a nocturnal, predatory species that feeds on small inverterbrates such as midge and mosquito larvae. They do best in a well oxygenated tank with moderately fast water flow, soft, slightly acidic water, and subdued lighting. They prefer warmer water, ideally between 77 and 86 degrees F., a densley planted, sandy bottom tank with plenty of caves, rockwork and driftwood to hide in. Unlike some other algae eating Loricards they do not chew or eat bogwood however, they do eat organisms that grow on the wood. Zebra Plecos are an extremely shy and moderately territorial bottom dwelling species that usually hide during daylight hours and make their rounds in the aquarium during the evening. They must have an oxygen rich environment and warm water to thrive, but they can tolerate a wider range of temperature and water conditions, especially to induce spawning. The water conditions for breeding Zebra Plecos varies, but a temperature of 84 – 89 degrees, a pH of 6.3 – 5.85 and soft well filtered and oxygenated water is generally all that is required to start. To get them to spawn, you need to make them believe that there has been a rainy season. Drop the water temperature to 85.7°, the pH and water hardness slightly and increase the water movement by performing frequent water changes. Zebra Plecos are not sexually mature until they are about four years old which is why many tropical fish keeping enthusiasts initial fail. Zebra Plecos breed in caves where the females will lay from 7 to 15 eggs in the back of the cave. The male will evict the female from the cave then guard and tend to the eggs which (if fertile) will hatch in 3 – 7 days. Frequently the first clutch of eggs will be infertile, almost like a “dry run” but subsequent spawnings should be productive. In 3 – 4 days the fry will start to develop fins, a sucker mouth, and their Zebra like color pigmentation. They will retain their egg sacks for up to 10 days during which time they should not be fed. The male will care for the fry until the egg sacks are fully absorbed. The fry can then either be either removed to a well aerated breeding tank, or left with the parents. Feed the fry baby brine shrimp, finely crushed dried food, or crushed frozen bloodworms until they accept larger portions. The young will reach 1″ in length in about 1 1/2 months. In a single species aquarium, Zebra Plecos normally take fine care of their young. Adult Zebra Plecos should be fed meaty foods as well as a high quality flake food, sinking carnivore pellets, frozen or freeze-dried bloodworms, tubifex, brine shrimp, daphnia , chopped mussels, and sinking carnivore wafers. These fish DO NOT eat algae. When they become available for purchase by tropical fish keeping enthusiasts, Zebra Plecos demand a premium price and are usually only 1″ – 1 1/2″ long.